While we were down visiting Kristen and her family for Kathryn's blessing day we decided to take a the kids to a place we'd never been before - on a tour of the La Brea Tar Pits (5801 Wilshire Boulevard, Los Angeles, CA, 90036). 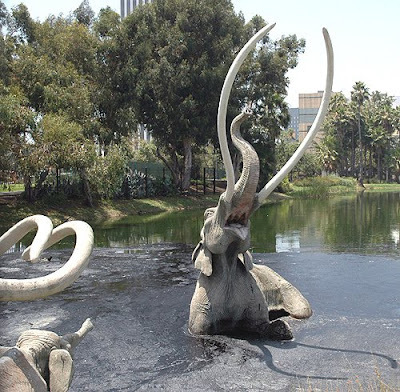 What are the La Brea Tar Pits, you ask? It was so cool to learn about all the fossils found in this one location over the last 100 years. Here's how it worked: the animals would come to check out the tar, get stuck, die in the black goo, and it would preserve their bones perfectly for us to discover several thousand years later. Here are pictures of real archeologists still hard at work every day at the tar pits. The tar pits are still active. Real tar just bubbles up from inside the earth. The only difference is that there aren't any animals getting stuck in there anymore - no new fossils - just old ones. Inside the museum we got to see just how sticky that tar really is. Here's Trevor at the tar pulling display. It was hard work to pull out of it! No wonder so many animals got trapped in the tar. There were so many fossils and full skeletons of animals found out there in those tar pits. 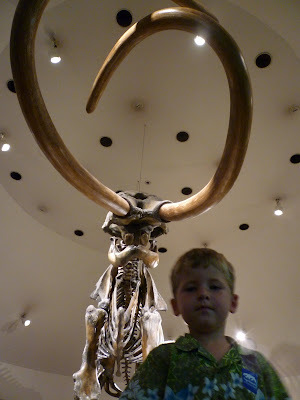 Here's Jackson with the mammoth. Those teeth were HUGE! 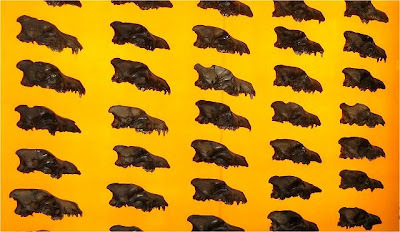 Here is a picture of a portion of the wall full of 500 wolf skulls. They are REAL skulls dug out of that tar. Packs and packs of wolves would get themselves stuck out there and would all die together. The kids loved this place. We will probably visit again when we get a chance. Here's a slideshow of more pictures from our outing. Enjoy!